This months Art elements themed design challenge is hosted by Diana Ptaszynski and the theme she chose is insects. It’s been a rather hectic month here and I didn’t think I was going to be able to take part but having spent best part of an hour trying to usher a huge Dragonfly out of the house and the clutches of the cat on Tuesday, I decided this was a sign and I should try and find time to do something. 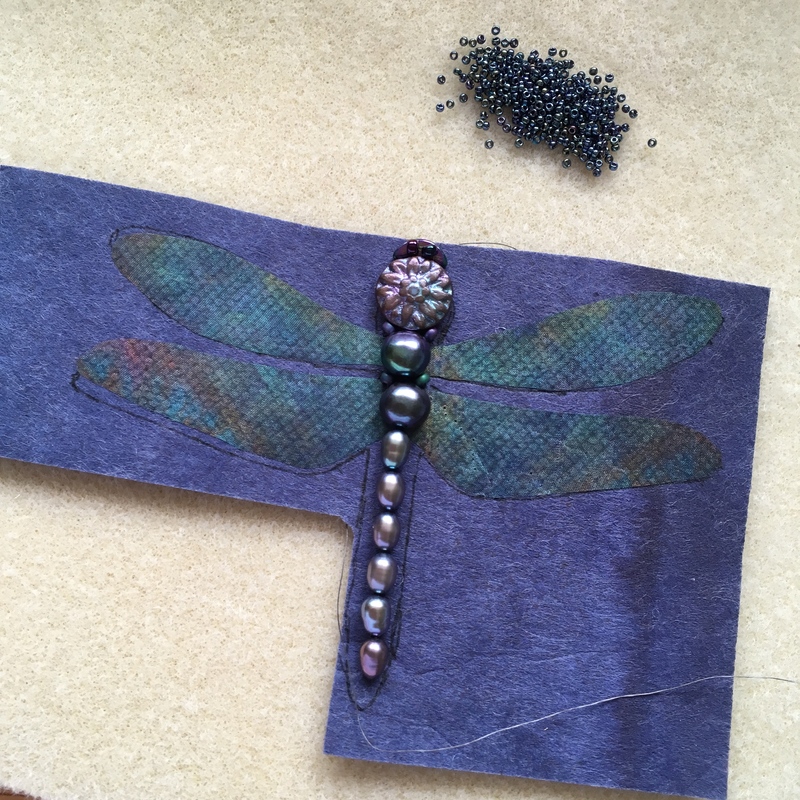 I love Dragonflies…they are such beautiful, otherworldly things that are fascinating to watch and whilst I could never do justice to the stunning example in the picture I decided to get the beads out and attempt my own representation. After cutting a template I knew I wasn’t going to have time to cover the entire piece in beads so I marked the shape our on some stiff stuff and then cut the wing shapes from a piece of silk and fused them to the stiff stuff using Bondaweb. For the head I used iridescent Czech glass beads and the for the body I used pearls with a lovely purple blue nacre. I used tiny seed beads to give the impression of veining on the wings. One the veining was done I cut around the template shape and edged it with delica beads and finished off with sparkly seed beads. I’m not sure what I’m going to with him yet…maybe frame him maybe use him as an applique so he may yet get some legs depending on that outcome. If you would like to see what the other challenge participants have made please join in our log hop using the links below…there are bound to be some great pieces with such a wide field of inspiration. Many thanks to Diana for giving us this challenge. Previous Art Elements – Component of the Month May Reveal. I’m glad you joined in! The dragonfly turned out beautifully! Wow! He’s so cool! I love the way you did the veining… I look forward to seeing what you decide to do with him. That’s beautiful Lesley, I always love seeing what you make! 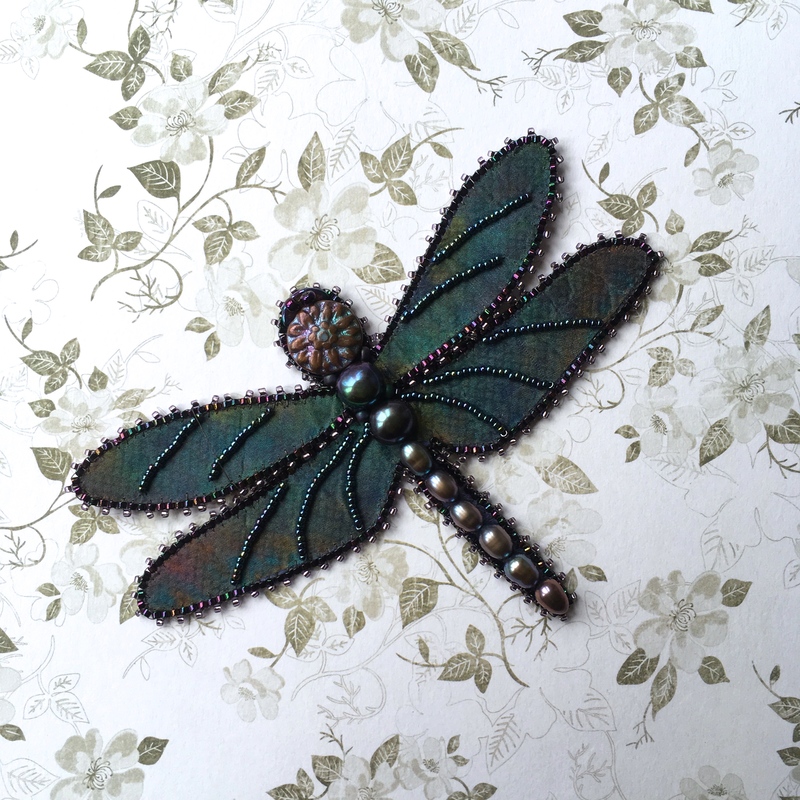 The dragonfly is so lovely and I just love how the fabric and the beads play together (but you know how much I love fabric in combination with beads, jewelery and mixed media). Made me giggle imagining you and Cleo battling over your visitor! Your version is gorgeous.. I love the pearls you’ve used for his body, their iridescence is perfect! So many possibilities for your dragonfly! I can’t wait to see where he ends up! Please share when you decide! Ooh that silk. Better with few beads to see the silk. I do think the Universe gave you a sign on that one – glad it wasn’t Cleo crunching on said dragonfly. I think he is utterly charming and I love the silk on the wings!